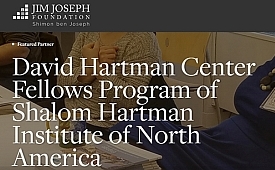 Last year, the Institute launched a North American cohort of David Hartman Center Fellows, already an established fellowship in Israel, as an incubator of emerging talent that educates top academic scholars to apply their own research and scholarship to the big questions facing Jewish life today. These scholars are then encouraged to share that thinking with the broader Jewish community. The inaugural cohort of seven top academic scholars from across the country represent diverse scholarly disciplines—rabbinic, modern Jewish thought, Biblical commentary, Judaism and Islam, legal theory, and philosophy—and diverse engagement in the Jewish community, including teaching in schools, adult education, and a Jewish printing house. Fellows are trained in a style of thought leadership enabling them to conceptualize and frame challenging issues of the day and equipping them to be change agents who will shape Jewish life. Together with senior Hartman research fellows, the Fellows explore areas such as Talmud as Thought Leadership; American Jewish Spirituality; and the American-Jewish relationship to Israel. As the first year of the program concludes, the Cohort has developed a network and ongoing relationships with each other as well as renowned scholars at Hartman. And, they will spend July at the Institute in Jerusalem, meeting with their counterparts in the David Hartman Center in Israel to better understand the transatlantic influence of thought leadership, and challenges and opportunities in the relationship between American Jews and Israeli Jews from a new perspective. The second year of the program will include year-long collaborative research, culminating in a series of public lectures, writing, and projects. Jim Joseph was a dedicated Jewish philanthropist who cared passionately about the education of Jewish children, youth, and young adults. He believed that focusing on young people was the best way to preserve a strong Jewish faith and proud heritage, thereby ensuring success of the Jewish people for the future. The Foundation seeks to inspire young people to shape for themselves what being Jewish means to them, and to help them integrate Jewish wisdom and practice with their other identities and interests.